I am so excited to share my little Napa Valley "Jewel box" bathroom. It's hard to believe I haven't been inside the Engelhardt house but designed this from across the country thanks to designer friends and the project manager who took field measurements of the bathroom for me. Let's take a look at the before so you can appreciate the transformation! 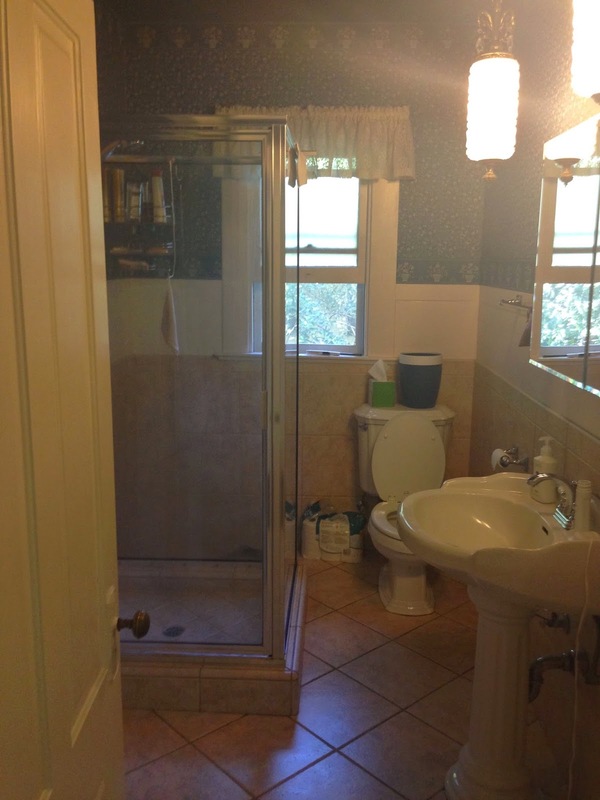 When I took on the project, the bathroom had a shower in the middle of the room. The toilet was under the window and the sink was on the right side of the room. There was dated tile on the floors and halfway up the walls. There was dated wallpaper above the tile. Our little bathroom was in need of a major renovation. 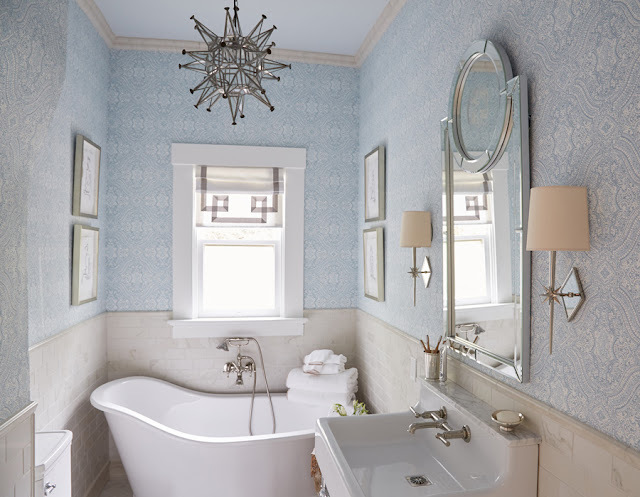 This showhouse was more like a client project than a showhouse since we had homeowners. 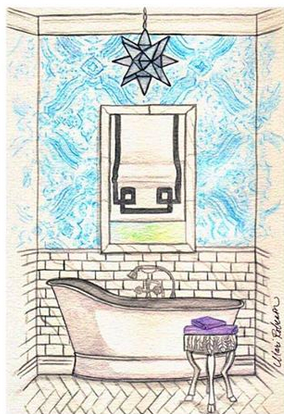 It was important to design a bathroom the Engelhardts would enjoy after the showhouse closes. The Engelhardts are a young professional couple. He works in San Francisco and she is the manager of the local inn located on the same street as their home. I enjoyed designing this bathroom for them so much! renderings. She is a joy to work with and is very fast! Mari stepped up and make this happen in one day for me! High Point Market is over, but the beautiful showrooms I visited are still dancing in my head. 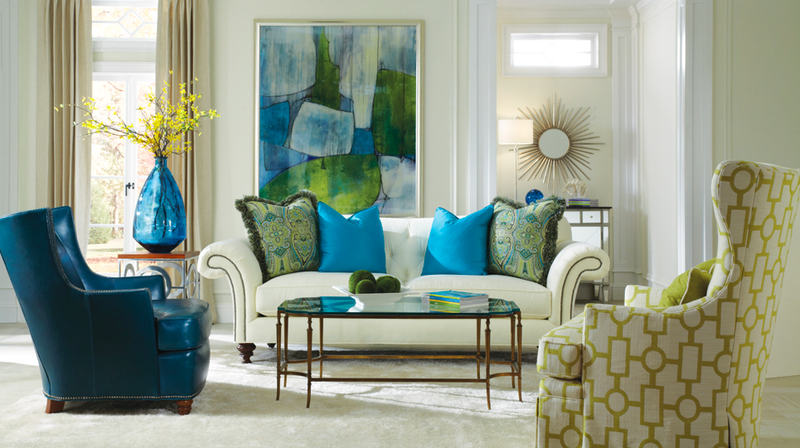 One of my favorite new showrooms was Huntington House Furniture. This showroom isn't on the main avenue, so I had to walk a bit to get there, but once I arrived, I was thrilled with what I found. Huntington House is a North Carolina-based company whose is passionate about producing quality furniture that is also comfortable while offering designs that are updated and luxurious. Everything is made in North Carolina! What can be better than made in the USA? Save The Date!!! 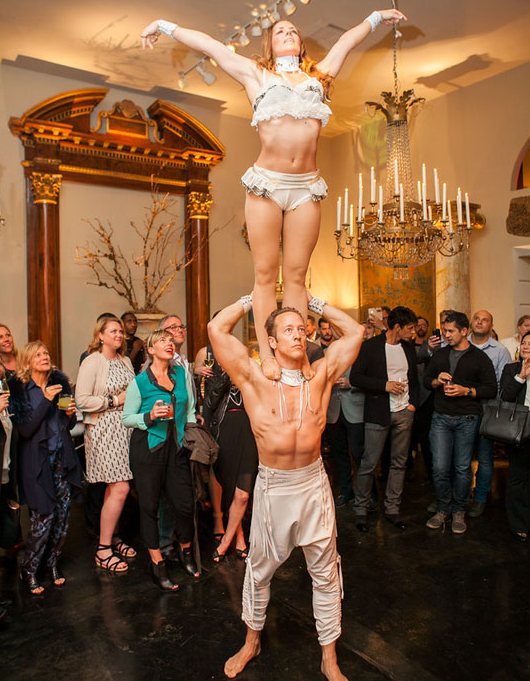 LCDQ Legends Event Date & Theme Announced for 2016!!!! Come One, Come All To The Greatest Design Event on Earth! THE THEME FOR 2016 ANNOUNCED!!! "The newly announced theme for LEGENDS 2016 – “One of a Kind” – has a double entendre. The LEGENDS event is, in and of itself, a unique extravaganza of design – and some would say, “one of a kind.” The theme also reflects the extraordinary character of the LCDQ and the furnishings sold in the quarter, from unusual antiques and vintage pieces to custom furniture, lighting, floor coverings, hardware and other home furnishings created especially by designers for the discriminating clientele that shops in the LCDQ". Excited to Be A Guest Stylist for Pine Cone Hill! Want to See What I Chose? Styling a Fall inspired bed with Pine Cone Hill's new Anatolia Collection was exactly what I needed to do to get in the mood for the change of seasons. 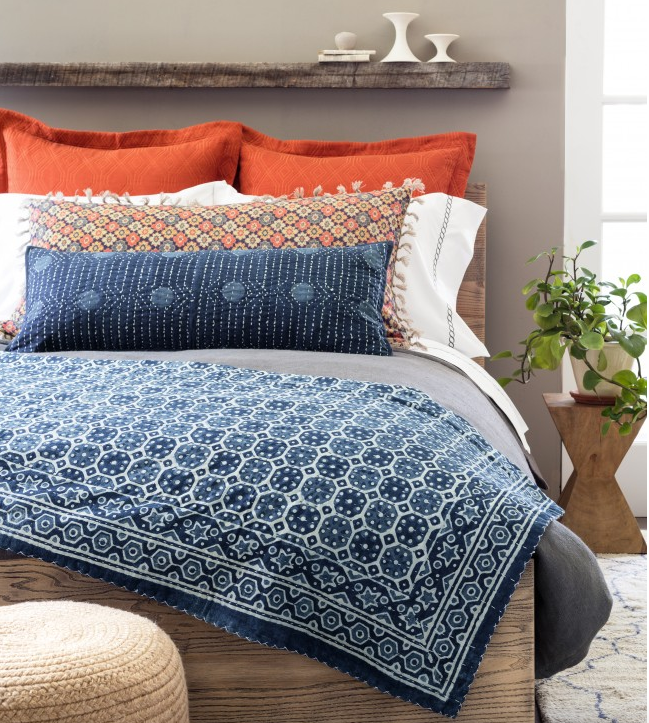 This eastern inspired global glam collection takes cues from oriental rugs and traditional Indian Kantha quilts. 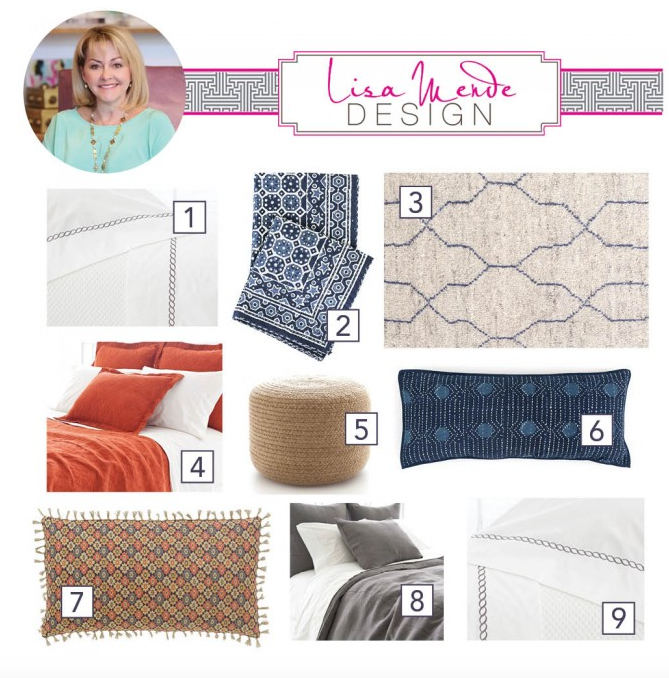 I had so much fun putting this bed together because of the rich colors and beautiful fabrics. I hope you like the combination of patterns and colors I chose. I'll admit I had my son in mind when I chose this, but what I like most about it is the combination works well for a guest room or an adult room. We have a special affinity for navy and orange at our house and fall Football Season is the perfect reminder of why since these are the colors for two of our favorite teams. Pop over to Pine Cone Hill's website and Shop The Anatolia Collection! Want to get this exclusive look at home? 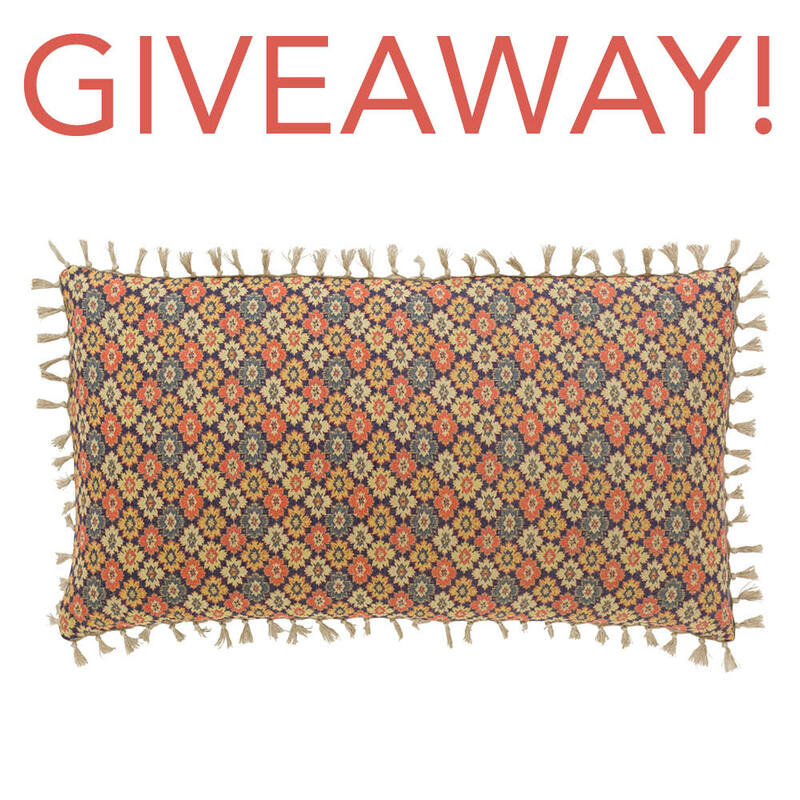 Annie is giving away one her favorite pieces from Pine Cone Hill’s new Anatolia collection—the ultra-cozy and over-sized 22″x40″ Anatolia Linen decorative pillow, valued of $150! Check out the Rafflecopter entry form on The Fresh American Style blog here for 4 easy ways to enter! Contest ends on Tuesday, October 20 at 11:59 p.m. EST. Make sure you pop over to The Fresh American Blog to register to win!!! 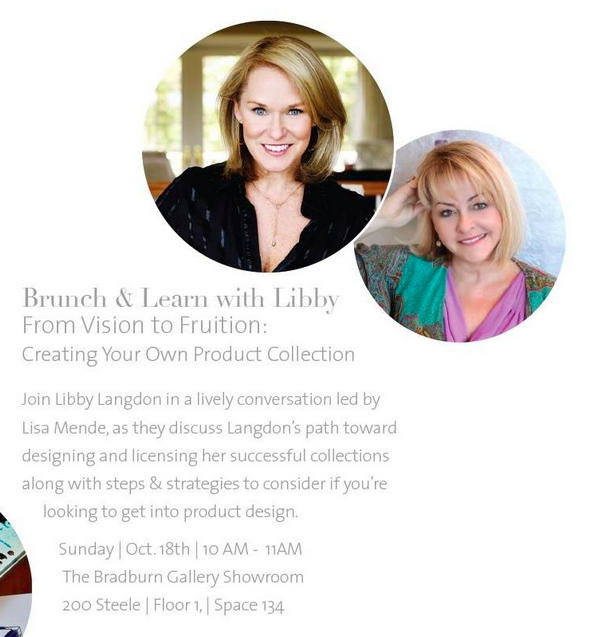 Join Libby Langdon and Lisa Mende for "Brunch and Learn at Bradburn Gallery on October 18th!! If you are coming to High Point Market in October, please join designer, auther, and makeover television personality, Libby Langdon and myself for a "Brunch and Learn" presentation at the Bradburn Gallery Showroom on Sunday, October 18th from 10am - 11am. See the beatiful new collection Libby has created for Bradburn and learn how to create your own product collections along with steps and strategies to consider if you are considering product design and licensing. There will be brunch bits, bubbly and lots of lively discussion. Hope you will put us on your market itinerary!!! Libby Langdon for Bradburn Gallery, Launch Party & Cocktail Celebration! dynamic collection of lamps, accessories and accent furniture. special piece from the Libby Langdon Collection! 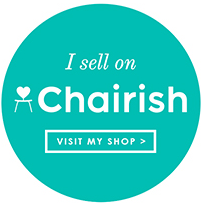 Cannot wait to see you at High Point Market!!! to make at 4:00pm!!! It's a don't miss event! on Sunday for the who's who of High Point Market!! Be There!!!!! 2nd Floor Hamiltion Wing.